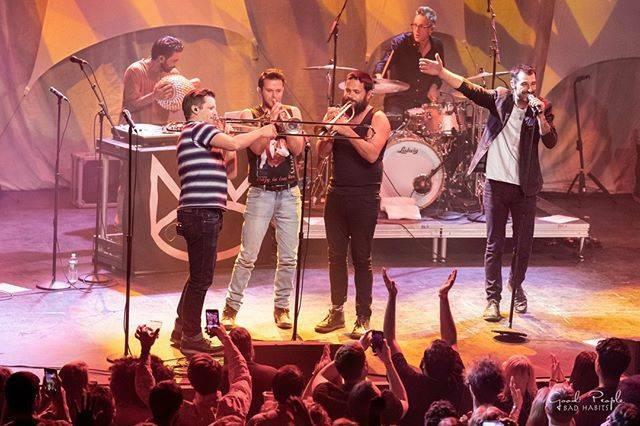 “This is gonna be a good one”, proclaimed The Cat Empire’s Felix Riebl after taking the stage at the sold-out Commodore Ballroom for the first of two shows in Vancouver. In a dizzying haze of sweat, sound and bright blue lights, an energized crowd danced away the night in agreement. With Caribbean and jazz influences, The Cat Empire’s offbeat rhythms made for a lively show that demanded movement. The audience could be seen waving their arms in the air and pogo jumping up and down—even those in the far corners of the room were bobbing their heads to the danceable tracks. The dynamic ensemble includes Riebl on vocals and percussion, Harry James Angus on vocals as well as trumpet, Ollie McGill on keyboard; Jamshid Khadiwhala on decks and percussion, Will Hull-Brown on drums, and Ryan Monro on both the bass guitar and the double bass. Roscoe Irwin serves as a second trumpetist and Kieran Conrau plays the trombone. The Australian group released their eighth studio album, Stolen Diamonds this February. 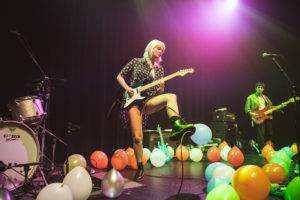 Their catchy, ska rhythms are infectious and the band continues to build their fan-base with the new album—the approximately 900 fans gathered at the Commodore spanned a 20-30 year age range. Whether the group was performing a new single from their latest release to long-time favourites, the diverse crowd appeared to know the words. Riebl frequently held his microphone over the crowd encouraging them to sing along. After the band left the stage, the crowd began to chant the melody of their final song. Not your usual cheering, they succeeded in drawing the group back onto the stage for an encore. As he returned to the stage, Riebl held his hand to his ear, to which the crowd quickly obliged with more cheers. With bright yellow and white lights glowing and occasionally flashing behind them, the group performed a few more songs including fan favourite, “The Chariot” from their self-titled debut album released in 2003. In celebration of St. Patrick’s Day, Angus took to his trumpet for a notable solo of the Irish ballad, Danny Boy. For the final song of the night and a self-proclaimed second encore, the group played the new track “Kila” from Stolen Diamonds. Nearing the end of the evening, Riebl concluded the 2013 track, “All Night Loud” with the verse, ‘Thank you my dear friends, and that’s goodnight.’ This time the happy, intoxicated crowd didn’t agree; as they carried the shows energy out into the night, some could even be seen dancing their way to the exit. Opening for The Cat Empire was Illinois’ Neal Francis. Accompanied by his three bandmates on guitar, drums and bass, Francis sung a selection of groovy, blues-inspired songs featuring his talented piano playing. The group had a vintage vibe that they channeled through their 1970’s inspired outfits, warm orange lighting and their smooth, reminiscent tunes. This entry was posted in concert reviews, Concerts 2019, the latest. Bookmark the permalink.